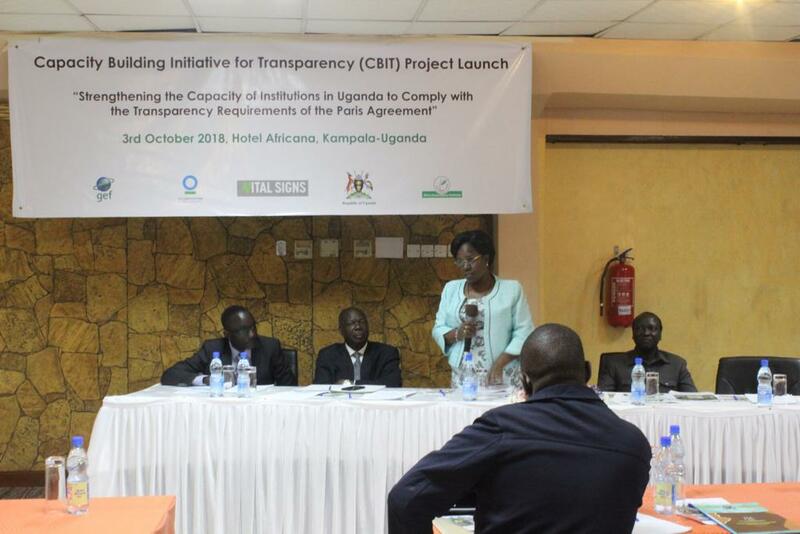 The project “Strengthening the Capacity of Institutions in Uganda to Comply with the Transparency Requirements of the Paris Agreement (CBIT)” was officially launched on 3rd October 2018 by the Minister of State for Environment Hon. 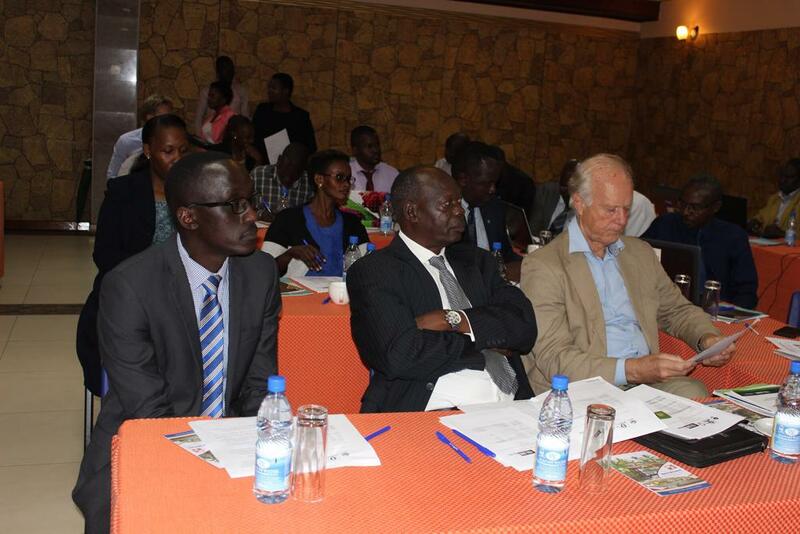 Kitutu K. Mary Goretti in the presence of key stakeholders from government, civil society and private sector at the Hotel Africana in Kampala. The 18-month project that’s funded by the Global Environment Facility (GEF), will be implemented in partnership with the African Innovations Institute (AFII) to strengthen the capacity of Uganda’s national institutions to track implementation of its ‘Nationally Determined Contribution (NDC) including its target of reducing Green House Gas (GHG) emissions by 22 percent by 2030. “I am delighted that this project is going to support the country in strengthening the capacity of key sectors and institutions to comply with the transparency requirements in the Paris Agreement which we are a signatory to,” said Hon. Goretti in her keynote speech. She added that it will also build capacity of stakeholders in key sectors of Agriculture, Forestry, Energy, Transport and Waste to collect, process and feed relevant and gender-disaggregated data into the CHG Emissions Inventory and Monitoring Reporting and Verification (MRV) systems. Hon. Goretti called for concerted actions against climate change saying the phenomenon is already impacting negatively on the livelihoods of Ugandans as a result of erratic and reduced rainfall and recurrent incidences of extreme weather events such as droughts and floods. On his part, the Africa Field Director of CI’s Vital Signs Program Dr. Peter Alele said that as one of the 18 accredited GEF Implementing Agencies (IA), Conservation International is helping countries in Africa including Uganda to access the GEF CBIT fund to strengthen their institutional and technical capacity to track and report their progress in attaining their climate change targets within the Paris Agreement. Currently, CI is implementing CBIT projects in Kenya, Madagascar and Rwanda and is working with a host of countries across Africa to launch similar projects to build their capacity. Eligible countries access funding for CBIT, upon request, through GEF Implementing Agencies like CI. “The Conference of Parties (COP) decision that adopted the Paris Agreement requested GEF to make arrangements to support the establishment of the new trust fund, the CBIT, to strengthen national institutions for transparency activities, provide relevant tools and training and to assist in improving transparency over time,” he said. Dr. Alele said that monitoring Green House Gas emissions and guiding human activities to ensure sustainability of our natural capital is vital for our existence. “We believe humans need nature to survive, nature doesn’t need humans. If humans think they can continue destroying nature and ecosystems to make more money, we will one day wake up to realize that money cannot save us,” he said. Chairman of the Africa Innovations Institute Prof. G.W. Otim-Nape said data-related barriers and human capacity shortcomings previously made it difficult for Uganda to accurately report on its progress towards achieving its NDCs and on reducing GHG emissions. “There shall be a great need to utilize the capacity this project will put in place so that the needed GHG data and information for Uganda is generated to enable the country meet its transparency requirements,” he said. Article 13 of the 2015 Paris Agreement establishes the “Enhanced Transparency Framework” requiring countries to regularly provide a national inventory of greenhouse gas emissions (by sources) and removals (by sinks) as well as information necessary to track progress towards achieving their Nationally Determined Contribution (NDC). Also required is information related to climate change impacts and adaptation as well as financial, technology transfer and capacity building support needed and received among other things.